For other uses, see Río de Oro (disambiguation). Stamp of Rio de Oro issued in 1907. Río de Oro (Spanish for "Gold River"; Arabic: وادي الذهب‎, wādī-að-ðahab, often transliterated as Oued Edhahab) was, with Saguia el-Hamra, one of the two territories that formed the Spanish province of Spanish Sahara after 1969; it had been taken as a Spanish colonial possession in the late 19th century. Its name seems to come from an east–west river which was supposed to have run through it. The river was thought to have largely dried out – a wadi, as the name indicates – or have disappeared underground. The Spanish name is derived from its previous name Rio do Ouro, given to it by its Portuguese discoverer Afonso Gonçalves Baldaia in 1436. The Portuguese prince Henry the Navigator dispatched a mission in 1435, under Gil Eanes and Baldaia, to find the legendary River of Gold in western Africa. Going down the coast, they rounded the al-Dakhla peninsula in present-day Western Sahara and emerged into an inlet, which they excitedly believed to be the mouth of the River of Gold. (See Senegal River.) The name continued to be used for the inlet and the surrounding area although no gold was found there, neither in the water of the narrow gulf, probably mistaken for the river itself, nor in its neighborhood. Occupying the southern part of Western Sahara, the territory lies between 26° to the north and 21° 20' to the south. The area is roughly 184,000 km (114,000 mi), making it approximately two thirds of the entire Western Sahara. The former provincial capital founded by the Spanish was Villa Cisneros, which was renamed under Moroccan administration in 1976 "ad-Dakhla". The Battle of Río de Oro was a single-ship action fought in August 1914 during the First World War. A British protected cruiser attacked a German auxiliary cruiser off the small Spanish colony of Río de Oro. 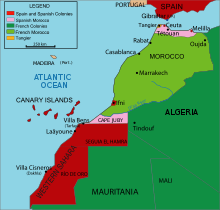 In 1975, as Spain retreated from the territory, Western Sahara was split under the Madrid Accords between Mauritania and Morocco, even if this division was bitterly contested by the Polisario Front. The dividing line ran halfway through Río de Oro, with Morocco taking the northern part plus Saguia el-Hamra, and Mauritania annexing the lower third of the colony as a northern province called Tiris al-Gharbiyya (Western Tiris). Its provincial capital was already called Dakhla. After a disastrous four-year war with the Polisario, Mauritania relinquished Tiris al-Gharbiyya, withdrew from Western Sahara, and left Morocco and the Polisario as the sole belligerents in the conflict, which is not yet resolved; a cease-fire has been in effect since 1991. This area is today divided by the Moroccan military berm, with Morocco occupying the parts to the west of it, and the Polisario Front-held Free Zone, under the control of the Sahrawi Arab Democratic Republic to the east. These zones are temporary divisions negotiated as a part of the United Nations Mission for the Referendum in Western Sahara (MINURSO) ceasefire. ^ Paxton, J. (2016-12-28). The Statesman's Year-Book 1971-72: The Businessman's Encyclopaedia of all nations. Springer. p. 1332. ISBN 9780230271005. ^ Law, Gwillim (1999-10-01). Administrative Subdivisions of Countries: A Comprehensive World Reference, 1900 through 1998. McFarland. p. 412. ISBN 9780786460977. ^ IBP USA (2006). Morocco Country Study Guide. Int'l Business Publications. pp. 26–27. ISBN 978-0-7397-1514-7. This page was last edited on 19 January 2019, at 05:17 (UTC).